I have been waiting to write this post for what feels like forever!! I am so excited to share this with you all! This was such a special day for me and a day that I will remember forever!! This event was actually the very first brand event that I have been able to go to so this was so special! I get lots of invites but I can never go to these events because of school and my super busy college life schedule. This event happened to be at the exact right time and place and I was so lucky that my schedule allowed me to go! Yay!! As you all know, Lauren James is one of my absolute favorite brands. All of their designs are so unique, classic, and pretty. I just adore them as a brand!! Exactly two weeks ago I was in Nashville for the Lauren James event!! We are going to back track a minute to when I got invited to this event. I actually received my invite back in December before Christmas. I actually missed the email and LJ had to message me on Insta so they could send me the actual invite in the mail lol. If that is not my life, I don't know what is. I was so excited I literally called my mom freaking out! I was so so so excited!! My mom ended up going to Nashville with me which was amazing that I got to share this experience with her! When we began looking into booking this trip we quickly realized that we would have to make it a really quick trip. I could not miss too much class and my mom could not miss lots of work. That left us with a very short timespan. Since the actual event was on a Wednesday evening, we decided to fly out that morning. So, we got up at 4 am to get ready and got to the airport by 6 am. We actually had to fly to Chicago and then to Nashville so it was a long morning of travel. We landed in Nashville a little bit before 11 am and literally hit the ground running. It was such a gorgeous day. It was 60 degrees and not even a cloud in the sky. We went to Green Hills Mall to get some lunch and to shop! We ended up going to Cheesecake Factory which was really yummy (and something we have in STL so we did not get adventurous lol). After lunch, we went shopping around the mall which was really fun. I stopped at MAC and picked up a lipstick that I wore for the event, went to Lilly and got a pair of earrings that I had been eyeing ever since they were released and I also wore them to the event. We then went over to 12 South which is one of my favorite places in Nashville. We went to Draper James, Reese Witherspoon's store, where I snagged the cutest t-shirt. I literally love Draper James. The whole atmosphere is amazing and the whole store is so darling. I mean they give you a little glass of sweet tea right as you walk in!!! How could it get any better?! They have so many cute new spring arrivals. And everything about the store is so picturesque. It has the infamous blue and white striped wall on the outside that literally everyone takes a picture with and it is right across from the "I Believe in Nashville" mural! So convenient!! Another thing I love about 12 South is that everything is in walking distance. Bar Taco is like a 30 second walk from Draper James and so is the Frothy Monkey. We ended up walking to Five Daughter's Bakery which has been a bucket list item for a while! I have always wanted to try their donuts since I am a donut fanatic! And let me tell you all, it was SO good!!!! My favorite flavor was the vanilla bean, so yummy! Five Daughter's Bakery is also super cute and has the cutest outdoor seating area. My mom and I actually took a couple of minutes to sit outside and eat the donuts, it was so nice!! We then checked into our hotel. We stayed at the Westin Hotel in Downtown Nashville. It was so nice and the lobby was just gorgeous!! They had terrariums and little cacti everywhere. We ended up chilling out for a little bit and then it was time to get ready for the event!! I was so nervous and excited while I was getting ready!!! I was about to meet so many bloggers that I looked up to and only dreamed of meeting! How cool is that?! I ended up taking an Uber over to the event which was at The Cordelle. The Cordelle is a wedding venue in Nashville and was absolutely gorgeous. I think it was an older home at one point and then was renovated into this gorgeous wedding/event venue. I was walking in and not even kidding as I was walking in someone yells "Oh my gosh!! Is that Missouri Prepster?!". I was in such shock!! I never expected that to happen at all! I walked in and was greeted by all of the Lauren James employees who were SO SWEET and it was great to put names to faces since I work with Lauren James a lot! I then met one of my followers, Carly, who actually won the Lauren James giveaway to come to the event. She was the literal sweetest being ever and I am so happy that I got to meet her and talk with her! Right as you walked in, the entire Spring Collection was out for showcase and let me just tell you all it is SO GOOD!!! Everything is so cute and I just know you all are going to absolutely LOVE it!! I then met Lauren Stokes, the founder and owner of Lauren James, herself. Lauren is the absolute definition of a girl boss! She chased her dreams and made it into a reality and even now as a full-time working mom owning her own business! Like wow such an inspiration! She was so sweet and I loved chatting with her about her darling kids and Lauren James itself. We then got to mingle for a little bit and then Lauren got up and announced that Lauren James was rebranding!! How exciting?! 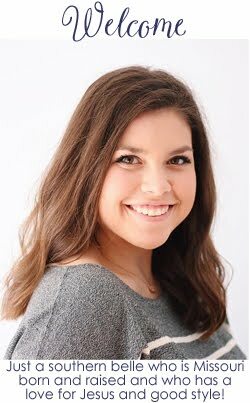 I mean if you loved Lauren James before, you are REALLY going to love them now!!! Their packaging now is just the cutest and I am obsessed with their new logo!! It was so inspiring listening to Lauren share her story and her passion with Lauren James and being in the same room with all of my favorite bloggers. And let me tell you all, I have never felt more like myself in a room full of people than I did then! It was amazing. All of these girls around me shared the same love of fashion, blogging, beauty, and are so passionate about their work as I am. It was absolutely amazing and so motivating! I got to meet Emily from @champagneandchanel, Dede from @dressupbuttercup, Lauren from @lc_steele (she is the cutest soon to be mama ever!!! ), Chelsea from @chelseaolivia13, Natalie from @nataliekennedyblog, Hilary from @byhilaryrose, Kelsie (name twin!!!) from @kelsiebynum, Shea Leigh from @shealeighmills, and Katy from @mumuandmacaroons and SO many more!! Meeting all of the amazing girls was so inspirational for me and so empowering!! The event was so much fun! Being one of the firsts to see the whole brand new Lauren James spring collection was just an amazing experience. Like I said before, also just meeting all of those girls was just so inspiring and really confirmed why I started blogging. Without you all, I would not have had this amazing opportunity. So thank you all for choosing to follow along and supporting me! It means the world to me and I am so grateful for you all! You all are literally making my dreams come true!!!! From the bottom of my heart, thank you all so much!!! I have added lots of pictures from my trip and also from the event!! I am going to be adding some more behind the scenes stuff from the event to my Instagram stories too!! I also added some pictures from my trip and the event down below! And as usual, you can shop everything below!! The cutest PR package I got when I left the event! Thank you again, Lauren James, for the great event and for inviting me! It was something that I will never forget and I had the best time ever!! Can you believe it?! 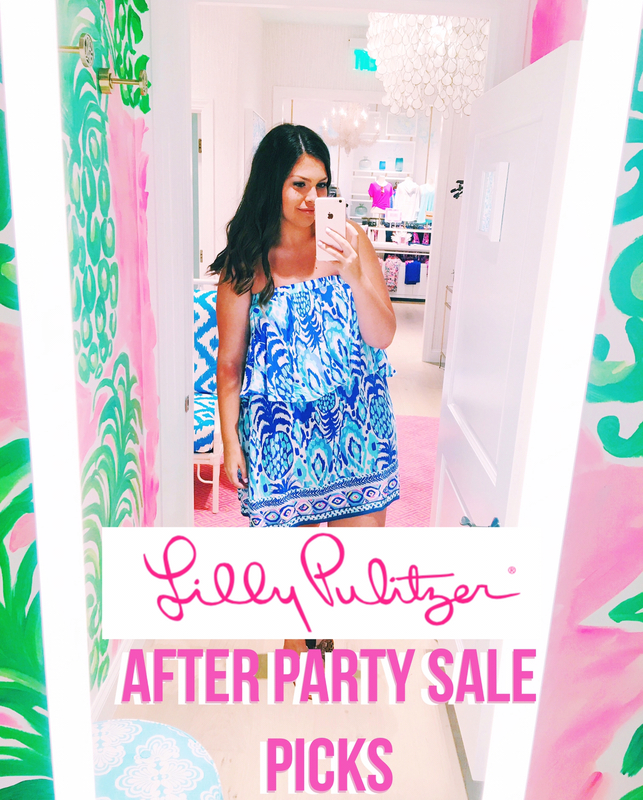 The Lilly Pulitzer After Party Sale is finally here!!! I get so excited this every time this sale rolls around!! There are so many great pieces included in this year's sale!! I got up bright and early this morning to shop the sale and didn't even have to wait in line!! I picked out some of my favorites for you all to directly shop!! Everything goes super fast in this sale and quantities of the items are limited. So, if you see something you like make sure you get it quickly!! Also, Lilly announced that they are going to add a second round of releases tomorrow morning so make sure to check back then! Y'all. 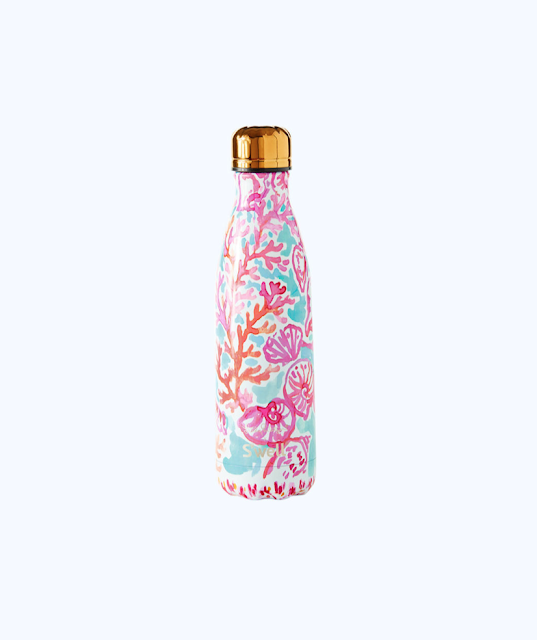 These S'well bottles are amazing!!!! I have 3 and love each and every one of them!! This sweater is EVERYTHING!!! I got it last year for Christmas and it is one of my all time favorite sweaters!! I am obsessed with the darling color of this sweater!! UGH THIS DRESS!!!!! 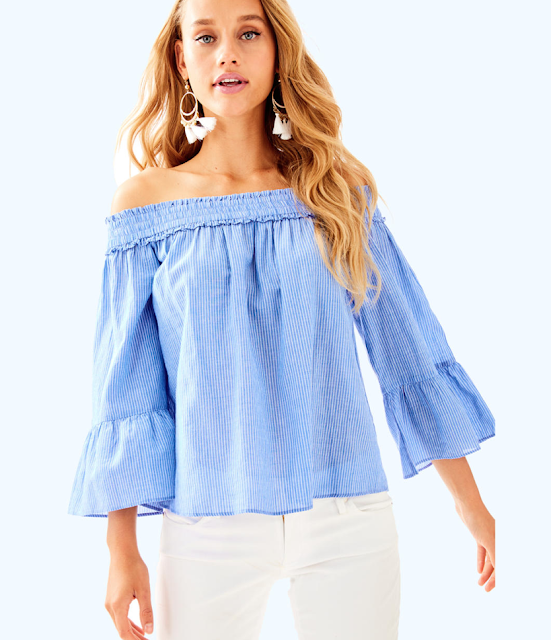 I love the off the shoulder and the darling ruffle and the bottom of the sleeve!!! I love this classic dress! This is a Lilly legend and lots of prints are on sale!! 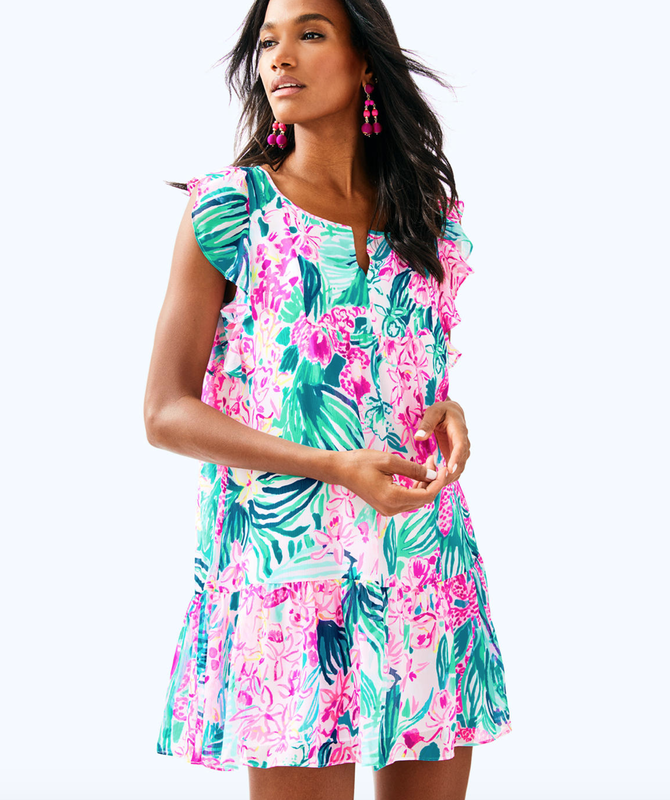 The moment I saw this dress, I immediately fell in love!! 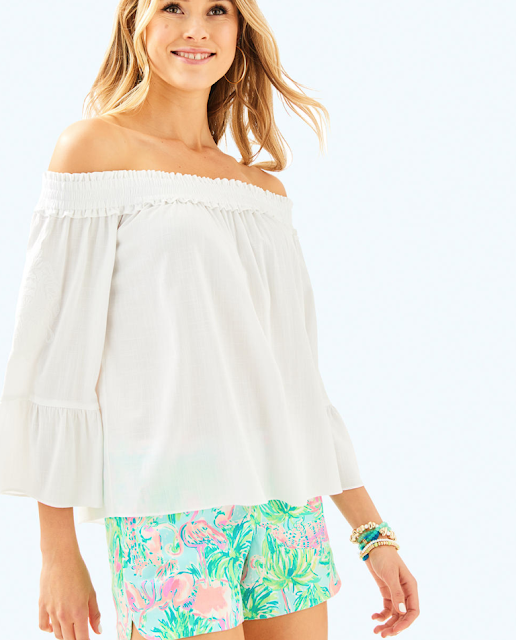 I am obsessed with the cold shoulder look and this print!! MY OH MY!!! This dress is giving me all of the heart eyes!!!! You all know I love pink and this embroidery is gorgeous! I am SO getting this sweater!! I love the tassels and the neckline is so gorgeous!! I had to share the white and lilac colors with you all!! SO PRETTY!!! 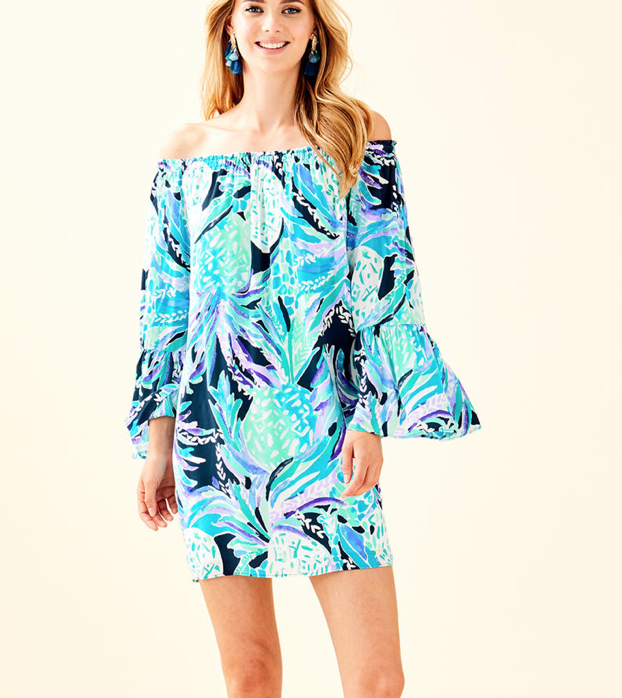 This dress is so fun!!! The print + the ruffles = a match made in heaven!! I love the sophistication of this dress. 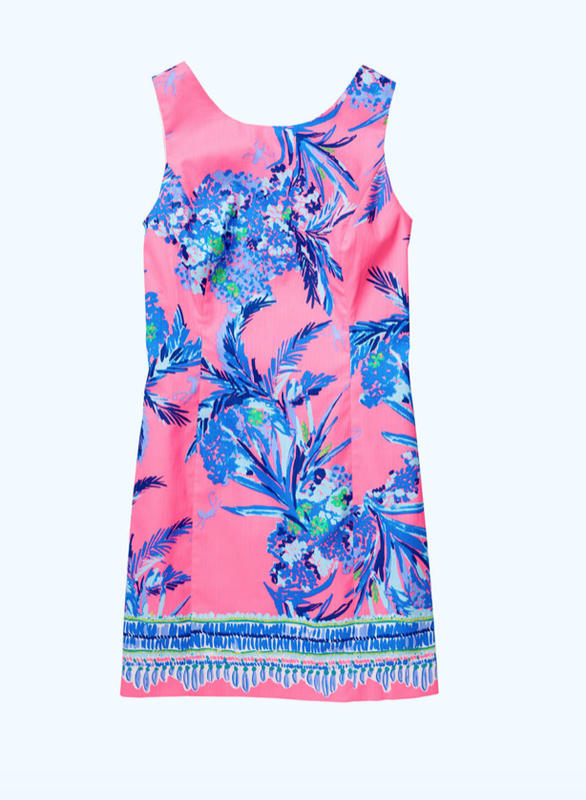 This is the perfect evening dress with the bold Lilly print!! This romper is perfect for spring and summer!! I love the bow on the waist to pull the whole look together!! 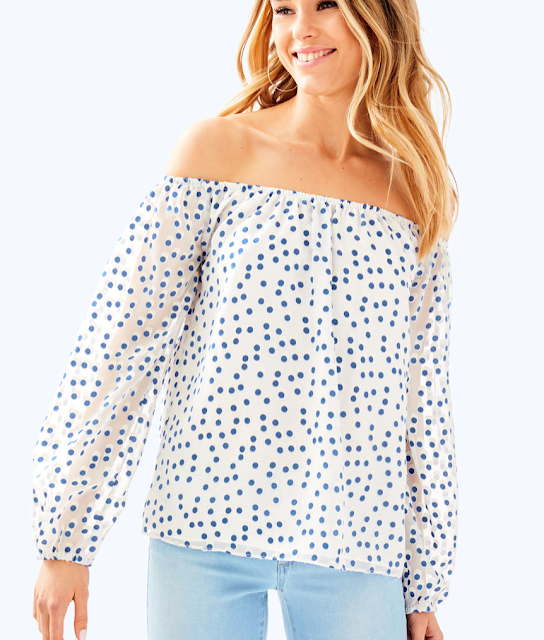 This is the most perfect everyday t-shirt top! It has the most darling details! I own this darling top and love it!! It is so easy to style and so fun!! This skort is so fun!! You can wear it to work out or to run errands!!! I love this subtle top!! 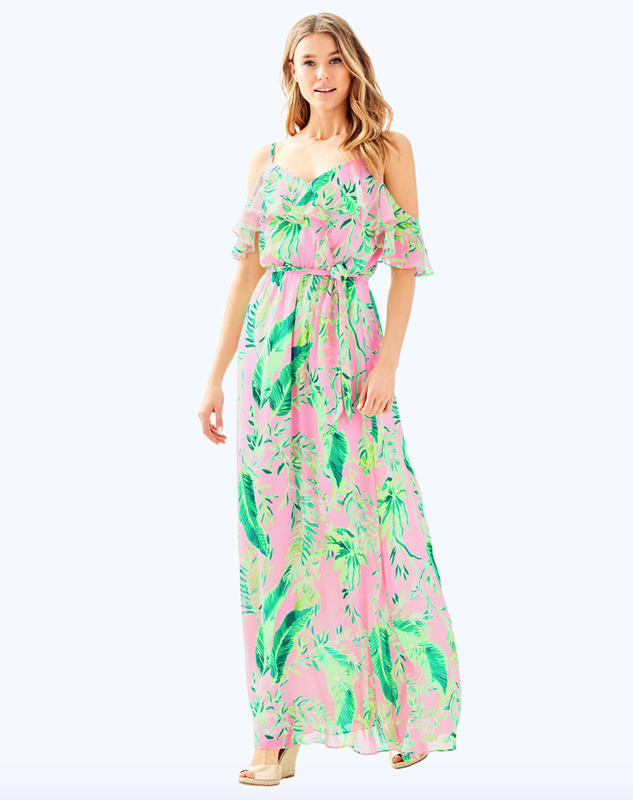 The cute little twirl on the bottom is so cute and fun! These earrings!!!!! 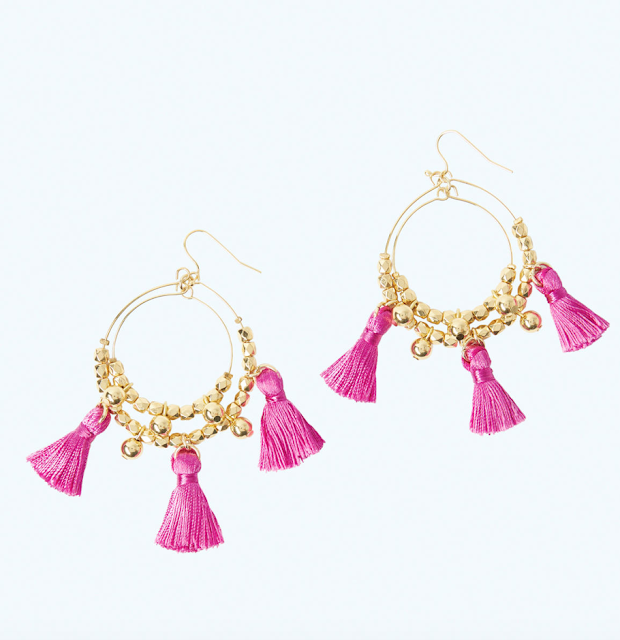 I love the pink tassels and all the detail!! If you were debating on what to get, this top is it!!! It can be worn so many ways and paired with so many things!! And the price is amazing!! Let's talk about polka dots!!!! I love this cute and classic look paired with the trendy off the shoulder!! So cute!! This dress is so perfect!! The amount of details in the lace and the seersucker skirt is amazing!! 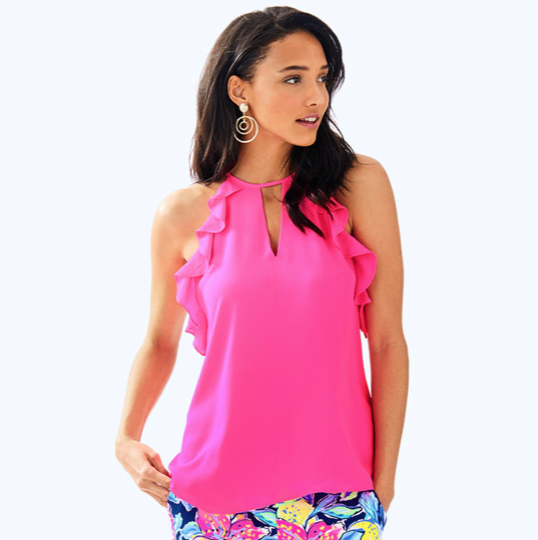 This top is the perfect top to transition from day to night! I am obsessed with the ruffle and cut out!! So cute!! I own this dress and get so many compliments on it!!! It is so cute and the back is perfect!! 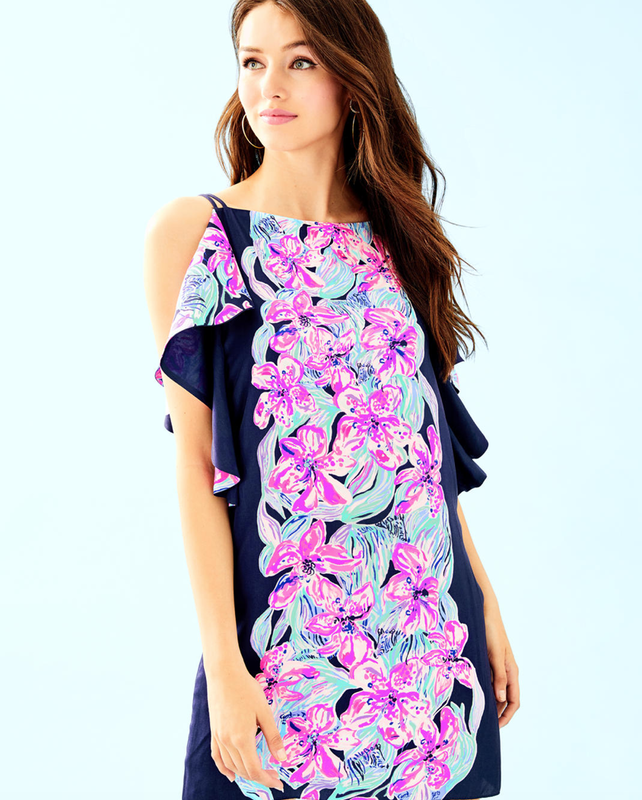 I have this darling blue pinstriped top and it is the perfect top for spring and summer! It is so lightweight and so cute!! Ugh this top!!! I love the cozy off the shoulder look and the darling pink!! Perfect sweater to wear no until spring! !